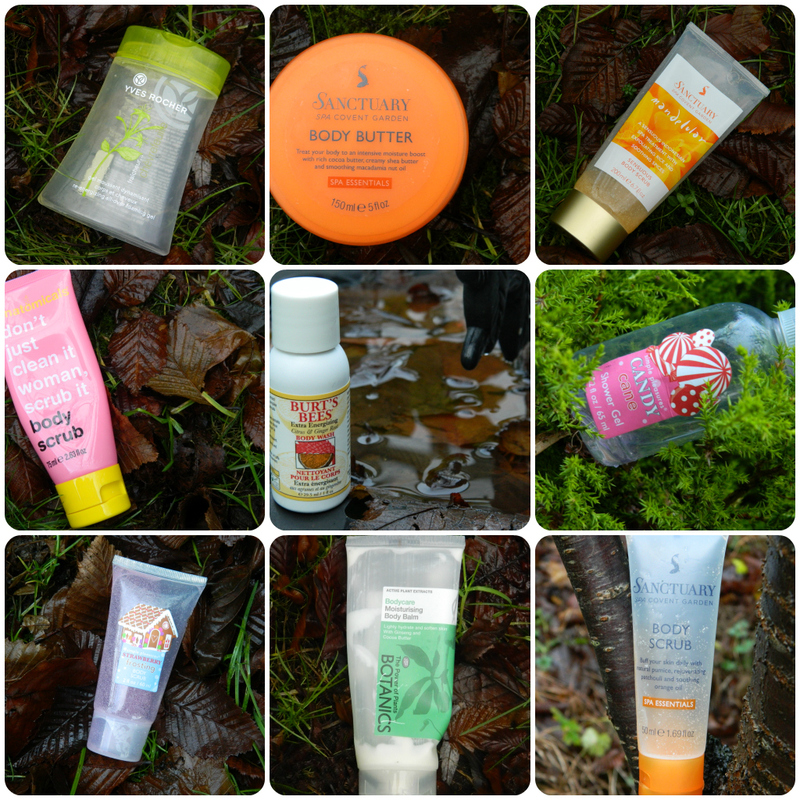 My December empties, I know this is a bit late but I have been quite busy. I have used up quite a lot in the month of December as I was trying to reduce my stash of bath/body products as I knew I would get a lot more as presents from family/friends. 1. Yves Rocher honeysuckle all over foaming gel: I bought this product a while ago and I have only just got round to using it as I have so many shower gels already. This product smells gorgeous, so fresh, light and floral! The scent doesn't last on my skin but this product is fantastic in all other respects. It lathers and cleans really well and apparently you can use this product as a shampoo which I haven't done so I can't comment but it is a great shower gel. Recommended. 2. Sanctuary Spa Body Butter: I have used products from this brand for years now and I still really like their products. This body butter is a really nice product, it smells nice (it smells like their classical scent) and it moisturisers my skin well. Although I find the scent boring after a while. Recommended. 3. Sanctuary Spa Mandelular Body Scrub: This product is quite rare, it is one of the few Sanctuary products that I hate. This is supposed to be a body scrub but it is so so gentle that it is basically a body wash - it didn't exfoliate my skin as it wasn't abrasive really at all but it does smell quite nice. Not recommended. 4. Anatomicals Don't Just Clean it, Scrub it Body Scrub: I love the name of this product, the packaging and the price - Anatomicals products are usually really cheap. I received this in a beauty box a few months ago I think and I was excited to use it. However the body scrub isn't very exfoliating, although it is more exfoliating than the Sanctuary scrub. The scent isn't great either - it is supposed to smell like grapefruit which I think it does to an extent but it also smells like cleaning products which is horrible - overall an average scrub with a horrible scent. Not recommended. 5. Burts Bees Citrus and Ginger Body Wash: I received this small bottle in a gift set a while ago and I was excited to use it as I haven't used too many Burts Bees products. This product I a disaster for me - the body wash is very runny which I am not used to so a lot of product can be wasted easily and the scent is awful. Citrus and ginger...why? Despite the awful consistency and the horrible scent, the body wash did work fairly well. Not recommended. 6. Simple Pleasures Candy Cane Shower Gel: Just a cheap shower gel I received in a very cheap set from House of Fraser. The shower gel packaging is very cheap and tacky but the shower gel itself is ok. The scent is definitely like candy canes which I don't really like as a body wash scent - overall a very average product. Not recommended. 7. Simple Pleasures Strawberry Frosting Body Scrub: Anther product from the same House of Fraser cheap set. This body scrub has the thinnest/runniest consistency of any body scrub I have used - not a great start. This scent is definitely that of strawberries but it is more cheap artificial strawberry sweets not frosting. The body scrub didn't work very well as the grains were too small. Overall, very average and not worth buying. Not recommended. 8. Boots Botanics MoisturisingBody Balm: I have finally reached the bottom of this bottle! This product has lasted ages! I received this as a gift and I really do like it but I was getting very bored of it towards the end. This product has a really nice, fresh scent and it is quite moisturising but I prefer body butters now - although I did love this product when I received it maybe a year ago now! Recommended. 9. Sanctuary Spa Body Scrub: Yet another Sanctuary product - I tried to use up as many bath/body products as I could before christmas as I knew I would get more as presents (I did!). This scrub has the same scent as the other sanctuary original products (which I am getting bored of now) and this scrub does work fairly well although I would personally like it to be more exfoliating than it is. Recommended. I love the Anatomicals body scrub packaging haha I quite enjoy your reviews, keep 'em coming! Looks like a of empties! I love Burts Bee's! Everything smells so good, mm mmm!